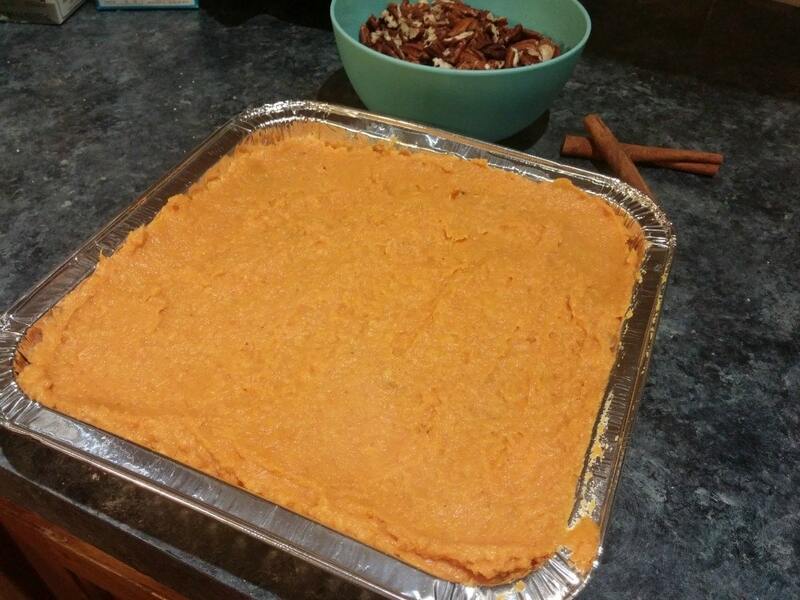 Sweet potato casserole is one of my favorite side dishes, especially on Thanksgiving! This recipe is a low carb version (or lower carb) than the traditional favorite, but still has 100% of the deliciousness! Ever since being diagnosed as a type 2 diabetic last year, I have done my best to minimize my sugar and carbohydrate intake as much as possible. My husband and I went extremely low-carb on an LCHF diet, but have since started to reintroduce SOME starches to our diet while still minimizing sugar and bread. 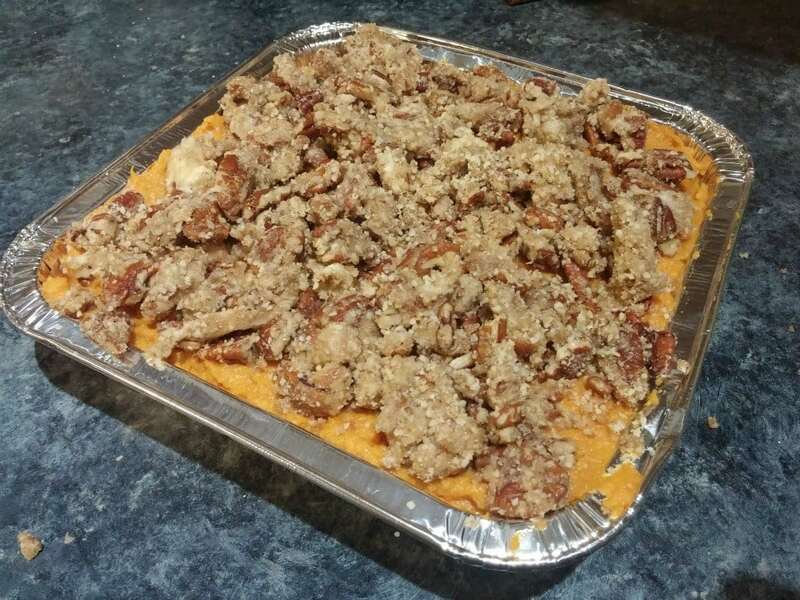 Holidays are hard when you’re watching your sugar, but I recently discovered SPLENDA® Brown Sugar Blend at Walmart and I was SO excited to be able to enjoy one of my favorite holiday dishes: Sweet potato casserole! I never did like sweet potatoes growing up. That was because my family either doused them in syrup, or topped them with marshmallows. All too sweet for my liking! 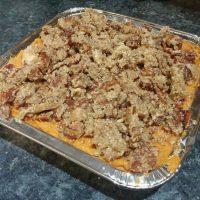 Then I was introduced to this amazing sweet potato casserole, and to be totally honest, things were never the same after. Now every single year, I’m requested to bring a double (or triple!) batch of this delish casserole. This year, I decided to give the SPLENDA® Brown Sugar Blend a try, and modify this recipe to be lower in sugar and gluten-free! Possibly my favorite part about this dish is that it can be made in advance. You’ll notice in my photos it has not been cooked. I made this ahead of time for Thanksgiving and popped it in the freezer. Now on Thanksgiving day I can pop it right in the oven (thawed or frozen!) and its one less thing to stress over! Oh and if it’s not Thanksgiving, you can always serve it with this delicious beef cross rib roast for an incredible meal! This dish goes fabulously with your Christmas ham too! If you’re freezing the casserole in advance, you’ll either want to thaw first and cook as directed OR you can bake from frozen, just make sure the internal temperature is a minimum of 165 degrees. I haven’t tried it from frozen, but I would suggest baking covered in aluminum foil so that the topping doesn’t burn. The holidays tend to be a very “sweet” time of year, which is hard for those of us watching our sugar consumption. I’m happy that alternatives now exist so we can still enjoy our favorite dishes. 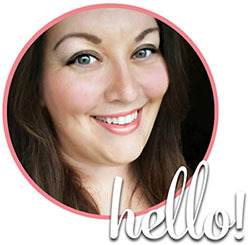 Did you know that the average American woman eats 3x the recommended daily amount of sugar? And that’s just on an average day, not even counting the sugar-binge holiday foods! Can you imagine eating 22 teaspoons of added sugar a day? Chances are that most women do! And don’t even get me started on all the calories in all that extra sugar. Did you know that swapping 1 cup of sugar for SPLENDA® can save 600 calories?! The other nice part about using SPLENDA® in place of sugar is that you actually use LESS. 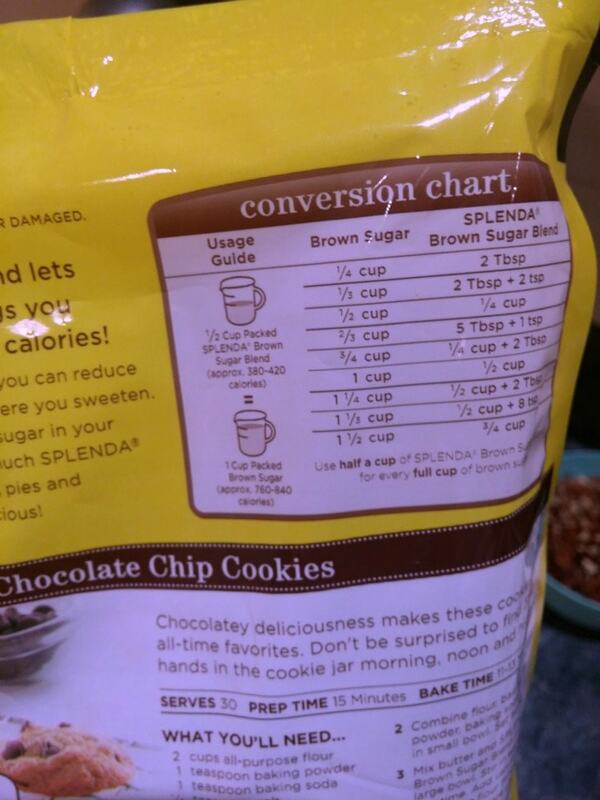 A general rule of thumb is about half the amount that you would use for sugar, but always check the handy conversion chart on the package to be sure. Sweet potato casserole has been given a low carb twist in this classic favorite recipe! Preheat oven to 325 degrees F. Roast the sweet potatoes until soft (alternatively, they can also be boiled, however roasting brings out their natural sweetness and flavor. 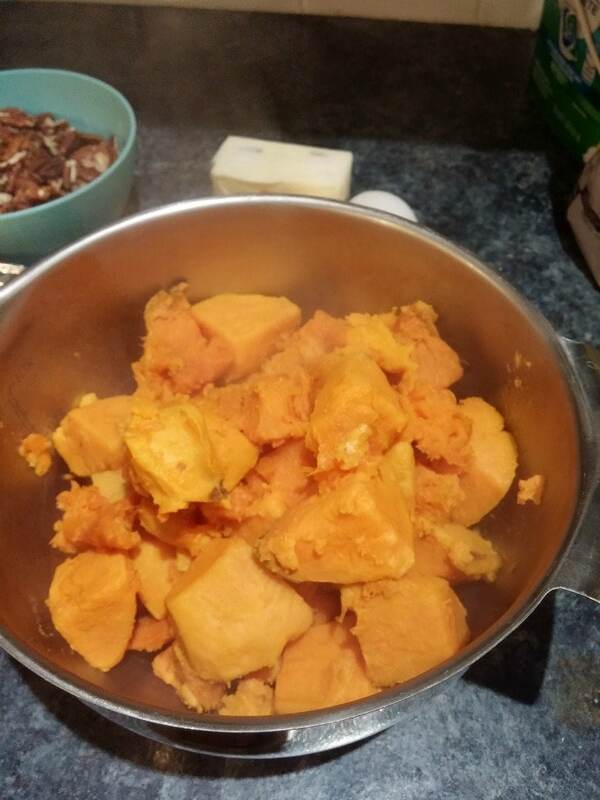 In bowl or stand mixer, mash/whip the sweet potatoes until soft and velvety. 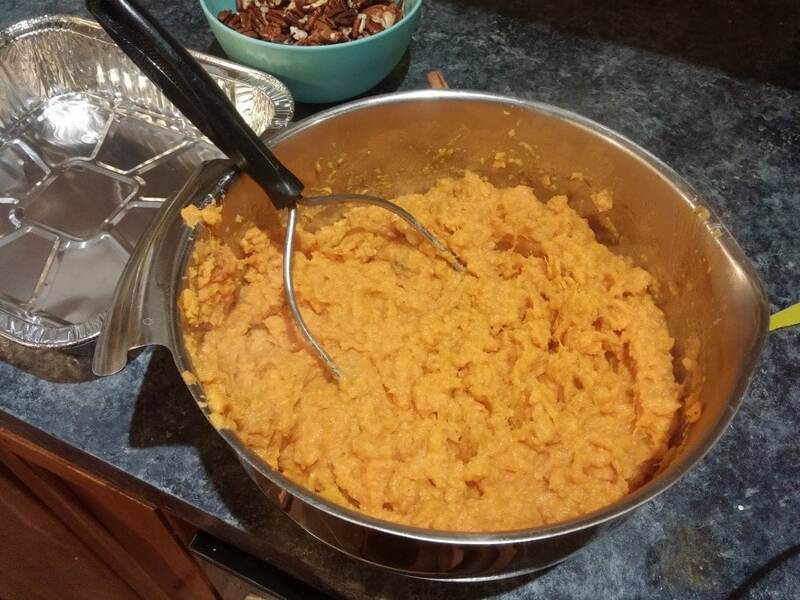 Mix together the rest of the filling ingredients with the sweet potato mash. Spread into a greased 9x13 baking dish. In a clean bowl, mix the topping ingredients until well-incorporated. Should be a moist yet crumbly consistency. Crumble the topping over the top of the casserole and bake 30 minutes or until topping is browned.